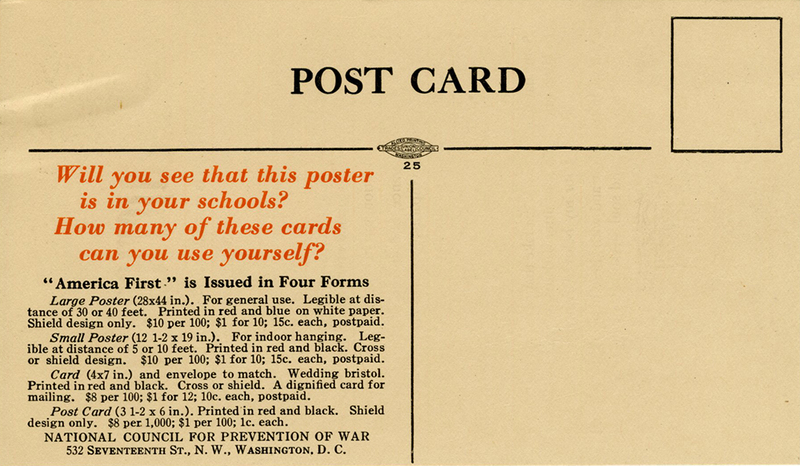 Postcard advertising the sale of posters, cards, and postcards printed with this anti-war message. Part of a campaign by the National Council for Prevention of War. Not merely in matters material, but in things of the spirit. Not merely in science, inventions, motors, and skyscrapers, but also in ideals, principles, character. Not merely in the calm assertion of rights, but in the glad assumption of duties. Not flaunting her strength as a giant, but bending in helpfulness over a sick and wounded world like a Good Samaritan. Not in splendid isolation, but in courageous cooperation. Not in pride, arrogance, and disdain of other races and peoples, but in sympathy, love, and understanding. Not in treading again the old, worn, bloody pathway which ends inevitably in chaos and disaster, but in blazing a new trail, along which, please God, other nations will follow, into the new Jerusalem where wars shall be no more. Some day some nation must take that path -- unless we are to lapse once again into utter barbarism -- and that honor I covet for my beloved America. And so, in that spirit and with these hopes, I say with all my heart and soul, "AMERICA FIRST." From a Sermon by Bishop G. Ashton Oldham, in Washington, D.C., September 7, 1924. 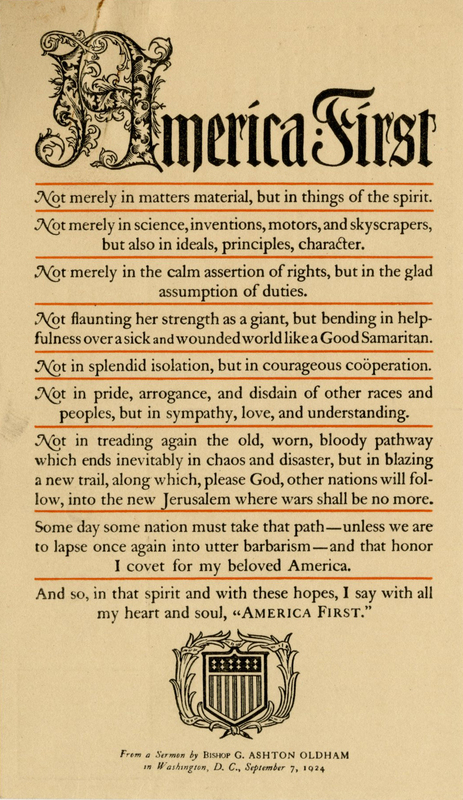 National Council for Prevention of War, “America First [postcard],” Social Welfare History Image Portal, accessed April 26, 2019, https://images.socialwelfare.library.vcu.edu/items/show/146.